In London, tennis is heating up. Serena Williams moves into the Quarterfinals! Serena has won two gold medals for double tennis with her sister, Venus. Speaking of Venus, she lost her singles match but at least she can cheer on her sister! And, Venus still has a chance to grab her fourth gold medal as she moves into the doubles quarterfinals with her sister Serena. Roger Federer also advances in his bid for his first Olympic tennis gold. Yesterday, American Andy Roddick lost to Djokovic and Great Britain’s own Andy, Andy Murray, moved on to Round Three. And one match breaks two Olympic tennis records. Tuesday, Canadian Milos Raonic and Jo-Wilfried Tsonga of France played the longest tennis match in Olympic history. Tsonga emerged victorious but both players should be proud. According to TheStar.com, “The match started just past noon local time and wrapped up nearly seven hours later. Play was delayed for almost three hours due to rain with players on serve early in the third set. The official match time was three hours 57 minutes. The third set alone lasted an even three hours. 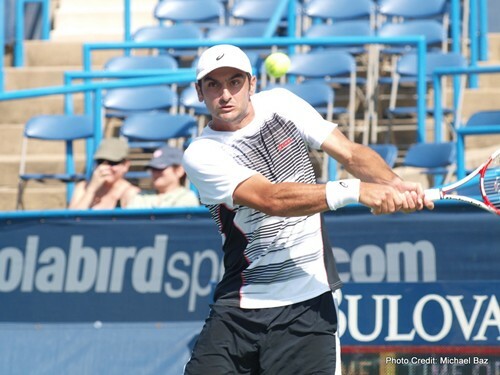 Back in the USA, Mardy Fish advances in the Citi Open. Mardy Fish has had a hard year. He sat out three months because of an irregular heartbeat then turned up in Wimbledon advancing to the fourth round. Then last week, Fish hurt his ankle. He had to pass up the Olympics but you can still watch him in the Citi Open. For a tennis fan, nothing beats the Olympics. American Andy Roddick won his first-round match over Slovakia’s Martin Klizan at Wimbledon. Roddick goes on to face Djokovic. Djokovic is the 2011 Wimbledon Champ. Roddick didn’t play in Beijing in 2008, in the 2004 Olympics he lost in the third round. The Williams sisters won their double match and both Serena and Venus won their first round single match. If Venus can win the gold she’ll be the new record holder with four gold medals in Olympic tennis. She’s won two gold medals playing doubles with her sister, Serena, and she won her single gold medal in Sydney in 2000. Thirty-two year old Venus was diagnosed with an autoimmune disease known to cause fatigue, watching her on the court, you’d never know it. Roger Federer also won his first match. The U.S. team is doing well, with John Isner and Varvara Lepchenko also advancing. Host country Great Britain’s favorite tennis star, Andy Murray, beat Switzerland’s Stanislas Wawrinka in his first singles match. The rain has caused scheduling difficulties, causing the biggest names of tennis to find most of them playing at the same time. So far Kim Clijsters is the biggest name to win a second round victory for her home country of Belgium.